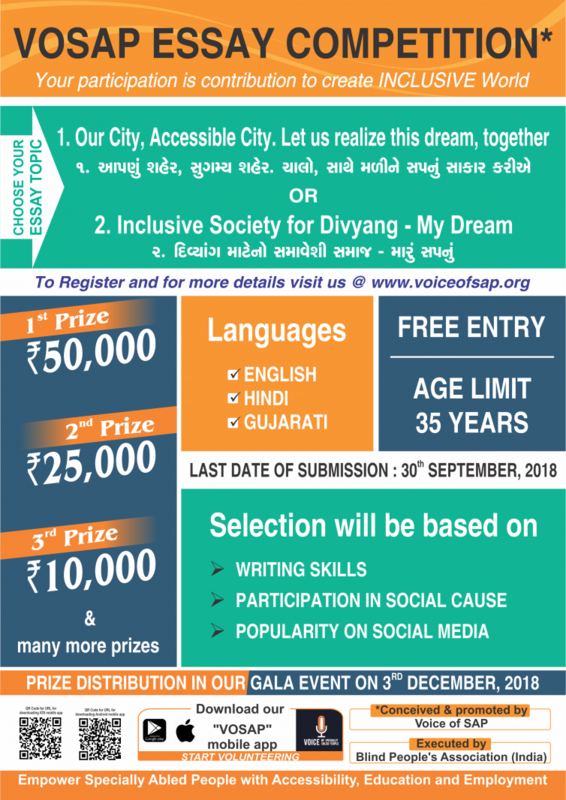 As part of the vision, goal to promote Inclusion and Empowerment of Divyang jan, Voice of SAP has launched an initiative of “VOSAP Essay Competition” in partnership with BPA, Amdavad. This initiative intends to inspire and engage youth in this much needed social transformation, inclusion agenda of 21st century to mainstream 7 crore Specially Abled People. The essay competition is open to all below age of 35 and one can write it in Gujarati, Hindi and English language. VOSAP believes that Rs 50,000, Rs 25,000 and several other prizes will ensure serious interest of respondents (students, professors, employees, their spouses etc.) wherein everyone is encouraged to to share their emotions, dreams, compassion as what they will do to create inclusive and accessible future society and city that they want to live in. September 30 2018 is last date to submit the entry, online on our website. Dec 1st 2018, on the eve of International Disability Day, Voice of SAP will recognize the winners with prizes in a special event in Amdavad in presence of 700 distinguished invited guests and dignitaries. Voice of SAP is a global advocacy organization (UN COSP accredited) with 4,200+ passionate volunteers, working towards creating an inclusive society, accessible to all Divyang jan. More details at our website – www.voiceofsap.org and also at unique mobile app “VOSAP”, which promotes accessibility.